This is a bizarre album. Possibly inspired by Santana's appearance in Guitar Hero 5, it feels like a cheap cash-in available only at participating Guitar Centers. A bunch of classic-rock covers, each one pairs the icon with a different set of guest musicians. 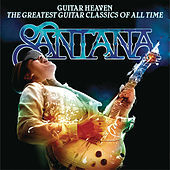 If you ignore sappy numbers like "While My Guitar Gently Weeps" and "Riders on the Storm," what you're left with is, believe it or not, Santana's heaviest guitar playing in a long time. This guy used to smoke, and he proves he still can on "Whole Lotta Love," "Can't You Hear Me Knocking" and "Back in Black," which actually features Nas.